GO PURPLE FRIDAYS ARE HERE! 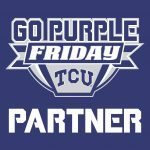 CAFE BRAZIL IS FIRED UP FOR GO PURPLE FRIDAYS at CAFE BRAZIL TCU GO HORNED FROGS! EVERY GO PURPLE FRIDAY …WEAR YOUR PURPLE and BUY ONE ENTREE get ONE FREE!